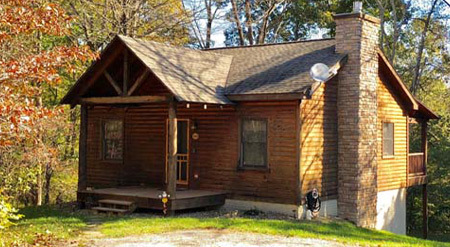 Hocking Hills Cabins | Search Hocking Hills Cabins in our Official Hocking Hills Visitors Guide. Brand new Treehouse getaway and four genuine log cabins privately secluded within scenic woods that include a stream and beautiful ravines. 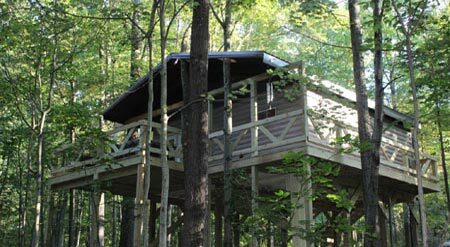 The Treehouse and cabins are perfect for a romantic couples getaway or a family vacation including your furry family member. Our properties feature hot tubs, fire rings, remodeled bathrooms and all the comforts of home. Romance is in the air! Real log cabins inside and out for couples. Only ten minutes from Ash Cave and Cedar Falls. Amenities include: private hot tub on a screened in porch, loft bedroom, seasonal gas log fireplace, fire ring with wood provided, fully equipped kitchen, TV/DVD, stereo, central heat and AC, stocked pond. For large events- weddings, receptions, reunions, graduations, corporate outings, (team building) multi-family, or family retreats. The Liberty Lodge is a 5300 Square Foot Luxury Home & horse ranch that is on 50 rolling, beautiful, scenic, private acres. Surrounded by hundreds of open, wooded acres with beautiful views. Unique sleeping spaces - 1 Large King Suite bedroom with small, separate/ connected room with twin Bunk and Small crib. Teen /Kidz Sleep zone, 1 Large Room that sleeps 10. (1 Queen and 4 twin Bunks) 2 Futons in Bonus Room. Sleeps up to 27 people with 2-Kings, 4-Queens, 5-Twin Bunk Beds, 2-Futons, and 1 Small Crib. Plus 3 Full Bathrooms. Large site for retreats, weddings, and conferences. Offers a secluded getaway within a short drive of Hocking Hills State Park, Tar Hollow State Park, and Wayne National Forest. This remote retreat features a lodge-like setting in the midst of 100 thickly wooded acres with meandering, private trails. Features a large indoor hot tub spa room, full kitchen, three bedrooms with linens, and flat screen TV with DVD player. Large recreation room has pool table foosball, transformer pinball machine, shuffleboard and bar. Beautiful outside gazebo with fire pit. 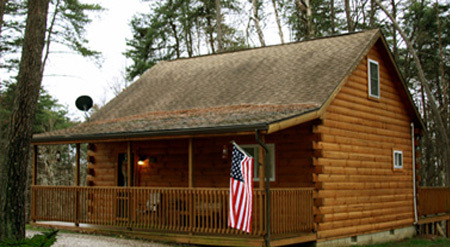 Buckeye Cabins offers secluded log cabin vacation rentals located in the heart of Hocking Hills. Most cabins feature hot tubs, pool tables, gas fireplace, central heat/air, direct TV with HBO DVD, fully equipped kitchen w/dishwasher and laundry rooms. Only minutes from Old Man's Cave. 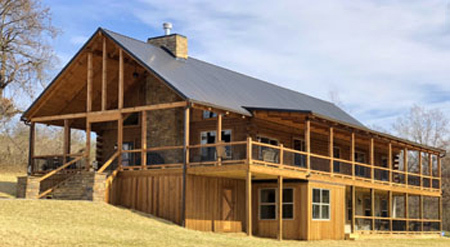 Cabins With A View is situated on 18 acres brimming with birds, butterflies, deer and other wildlife. 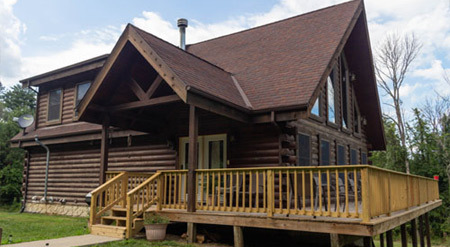 Privately tucked into the woods, yet only minutes from downtown Logan, our Buckeye cabin features 2 bedrooms, 2 full baths, a full kitchen, outdoor dining area, gas fireplace, hot tub, and recreation room with a pool table and darts. 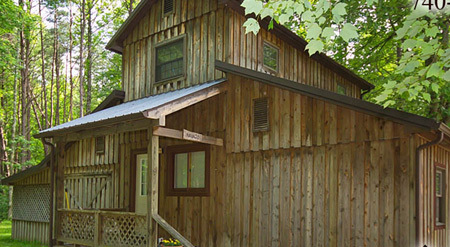 Our Firefly cabin is a cozy one bedroom cabin for two. 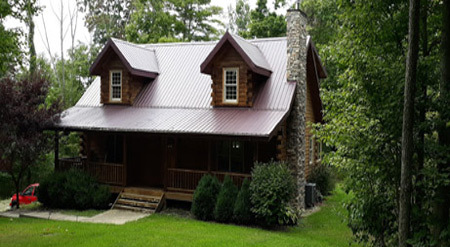 Located in the beautiful Hocking Hills region in southeastern Ohio, The Cabins at Hickory Ridge offers an excellent, comfortable retreat to this area. With fully equipped amenities and special luxuries such as hot tubs, fireplaces, and HDTVs, you may enjoy all the beauty and activities of the Hocking Hills and return to stress-free, charming, and cozy lodging. 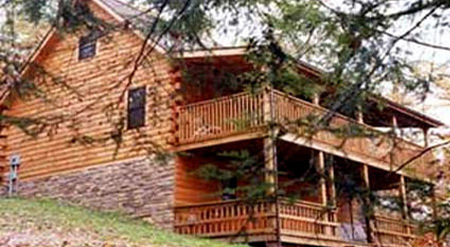 Offers three lodging options: The Lodge, the Woods Cabin, and the Homestead Cottage. Each location accommodates different group sizes, ranging from 6-12 (or more) at the Lodge, 4-6 at the Homestead, to a couples-only 1 bedroom at the Woods Cabin. Go to sleep listening to the sound of whippoorwills. Two secluded cabins on over 100 acres of privately owned land. Each cabin is fully equipped with full sized kitchens, large hot tubs, fire ring (wood supplied), gas log fireplace, sat TV, and wifi. The Loft has an open floor plan that can sleep up to 6. The Holler has 4 bedrooms and can sleep up to 12. We also offer private scenic wedding locations, and an open air style shelter that can accommodate up to 100 guests for receptions or events. We invite you to stay and enjoy a traditional log cabin experience or try our unique Treehouse experience on our secluded 60-acre property. 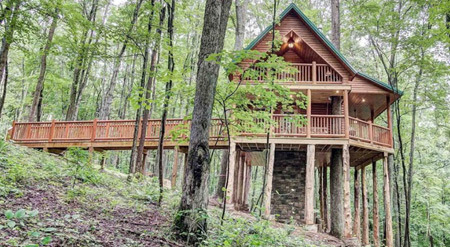 Nestled on top of a 200ft ridge, up 1,000ft in elevation, the two newly built traditional log cabins and newly built Treehouse are among a forest of canopy trees and wildlife. No need to leave the property as you can hike a private hiking trail that leads to small seasonal waterfalls, enjoy the outside fire pit or relax in the hot tubs. Each cabin is fully equipped with the finest amenities including a full-sized kitchen with granite countertops, king beds, gas fireplaces, flat screen TVs, seasonal outside showers and free WIFI/Internet. 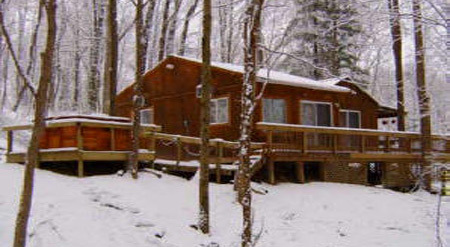 Tucked into the Hocking Hills, Blackberry Hill Cabin is a quiet hideaway for any season. A gas log fireplace welcomes guests with a comfy place to settle in on cool, winter nights. The porch has a swing for warm, summer evenings. Serene and secluded, there are eight acres surrounding our cozy cabin. And Blackberry Hill Cabin comes complete with a hot tub for that romantic evening beneath the stars. There is so much to enjoy at our cabin any time of the year. So stop in, relax and enjoy your stay in the Hocking Hills! TV/VCR, hot tub, fully equipped kitchen, fireplace with gas logs, picnic area and loft. Four cabin rentals. Each has a character all its own! Each has a fully equipped kitchen with modern appliances including refrigerator, stove, microwave, coffee maker, toaster, blender, pots, pans and all utensils. 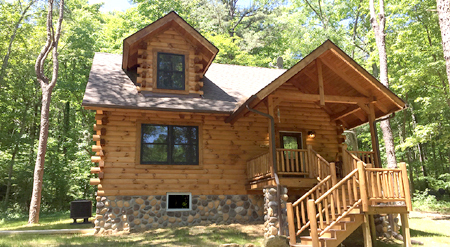 With a beautiful natural wood interior, these cozy cabins are comfortably furnished and include a stone fireplace. All the cabins offer central air-conditioning and heat. Whether as a romantic getaway for two or a family gathering, these Hocking Hills cabins feature the comforts of home tucked gently into a wilderness escape. Affordable family or romantic stays with clean and comfy rooms. 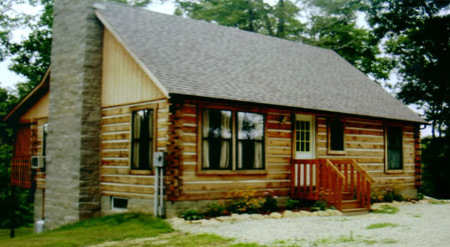 Ridge View Cabin - Features two bedrooms, a front and back deck, central heating and air-conditioning and hot tub. 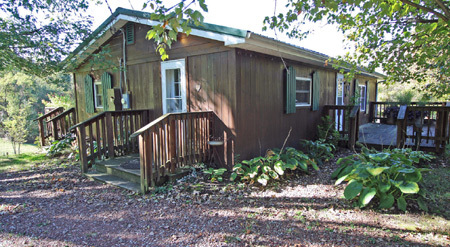 Settled gently on 40 acres, Ridge View Cabin offers travelers to the Hocking Hills plenty of room to explore without even leaving the property. Lily Pad - Romantic stay close to Old Man's Cave. One room comfort with electric fireplace, DirecTV and hot tub beneath a covered porch. Rock formations on the seven acres are fun to explore. 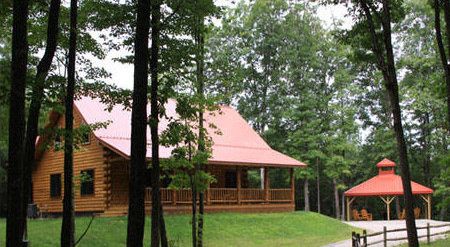 Nature's Pointe offers quality lodging for responsible couples and small families in the beauty of Ohio’s Hocking Hills. All of their properties offer the privacy and seclusion overnight visitors to the area desire. Decks featuring hot tubs overlooking the surrounding forests can be found at each cabin. Inside, you’ll find northwoods décor, comfortable furnishings, modern appliances and all the amenities you’ll need to feel right at home. Heat, a/c, fireplaces, stereos, DVD players, Wi-Fi and satellite TV are standard. 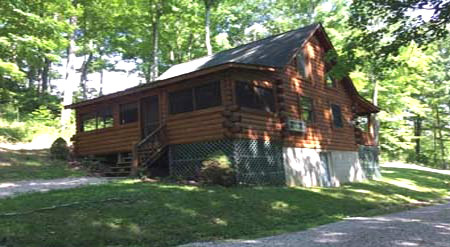 Cabin locations are close to the parks and all area attractions. Wildlife and bird viewing are excellent. Come visit Beverly Hills Cabin, a private, romantic cabin near Ash Cave. Deer and wildlife wander the property at will. Sit on the covered porch and watch the birds; hear the native pines whisper in the breeze. Kids and pets are always welcome. Hot tub, satellite TV, full kitchen, queen-size bed in loft and 10 acres. Close to parks, but tucked into the woods away from the crowds. You'll be treated like family. Come vacation with us; it will be a vacation to remember. The indoor sauna and hot tub bubbling within the screened porch leaves visitors feeling indulged, relaxed and ready to play at the cottage and in the Hocking Hills. Enjoy a drink at the tiki bar while playing pool or watching satellite television in the Island Lounge. 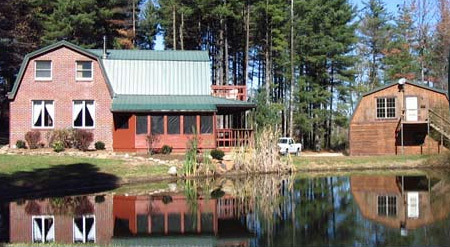 10 wooded acres offer the sights and sounds of nature, plus a pond and stream. The detached garage is ideal to park your motorcycle, classic car, ATV or bicycle after a day of riding in the hills.